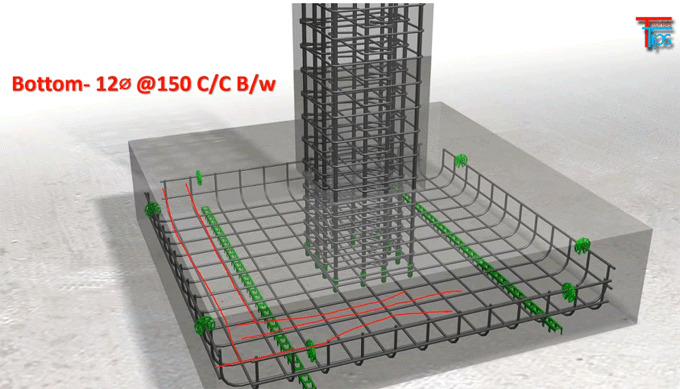 In this useful construction video tutorial, you will get the details of 3D reinforcement in civil structural drawing. Stirrups 8Ø@150 C/C – It means the stirrups or rings should contain 8mm diameter. The distance among two rings in a column should be 150 mm center to center. Bottom - 12Ø@150 C/C B/w (both way) – It is applicable in footing. The steel bars are placed horizontally and vertically in the footing. The distance among the two bars is 150 mm in both ways i.e. x axis and y axis. 3D reinforcement is provided in footing or foundation. It has the dimension like 12Ø@300 C/C three dimensional R/F. Suppose the length, breadth and height of a foundation are 2m, 3m and 2m. Initially, the steel bars should be placed vertically at the spacing of 300 mm with 12mm diameter. It means the spacing should be maintained as 300 mm to both x and y axis horizontally & vertically for settling reinforcement. 3D dimensional reinforced is used to make foundation strong to bear heady load.